That Pinot was Great...but Where's it From Again? I'll admit that this one might be more for you non-locals on the list, because most of you who walk in the door have probably already been turned on to the beauty of Pascal Henriot's Coteaux de Champlitte Rouge 2017 from the Franche-Comté department in France. Yeah, you're totally thinking that right now...and it's totally cool because I thought the same thing when I first encountered it. So what is a Coteaux de Champlitte? It's a wine, in this case, red, in this case 100% Pinot Noir (there can also be Gamay, and there are whites made of Auxerrois, Chard, Pinot Gris and Gewurtz), from the commune of Champlitte in the Franche-Comté department, which lies just North of the Jura and East of Burgundy. After it was decimated by disease and phylloxera in the late 1800s and then completely wiped out during WWI, it fell into obscurity. But the people of Champlitte (considered the prime vineyard real estate of France-Comté) began to replant in the 1970s and most of it ended up with the co-op. Today, Pascal Henriot is the sole remaining independent producer and he does everything right - certified organic, hand-harvest, native yeast, and minimal added sulfur. 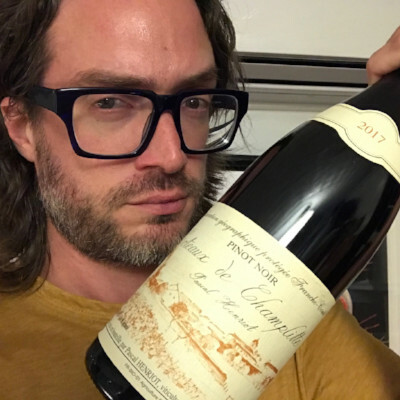 So now that we have the history lesson out of the way about what a Coteaux de Champlitte is, I want to tell you what this Coteaux de Champlitte is - and that's a fabulously aromatic, perfumed/floral glass of Pinot Noir with a bright, racy red-fruit profile, and lively acidity. The purity of the redness is something to cherish, balanced by a wonderful, mineral core and the lingering savory/herbal nuances. Add in the impressive backbone and you have a pretty complete wine for the modest price tag of $25. So complete and joyfully delicious, in fact, that it's been muscling other wines away from its spot on the shelf. All of you locals keep coming back in and asking for it and also, every time I taste another wine of similar character, I keep coming to the conclusion that, while this other wine is good, it's just not good enough to steal the spot from the Henriot. As a matter of fact, I tasted a wonderful glass of appellation Burgundy from the Cote de Nuits yesterday that was at a REALLY reduced price and was a fantastic deal for what it was, especially when you factor in the place whence it came and whose name was on the label. BUT, when I really thought about it, it just wasn't good enough (even at close to 50% off) to pull the trigger on, because...well...there sits the Champlitte at $25, offering much more character and intrigue. So, instead of continuing to let all the walk-inners reap all the benefit, I decided it needed a write up...so that you non-West Villagers could get in on the joy.